Benedict Cumberbatch: Code Breaker Alan Turing Was A Puzzle Himself Cumberbatch stars in The Imitation Game, as the British mathematician who helped break German codes. "It's a war thriller, it's a love story and a tragic testament to a genius wronged," he says. 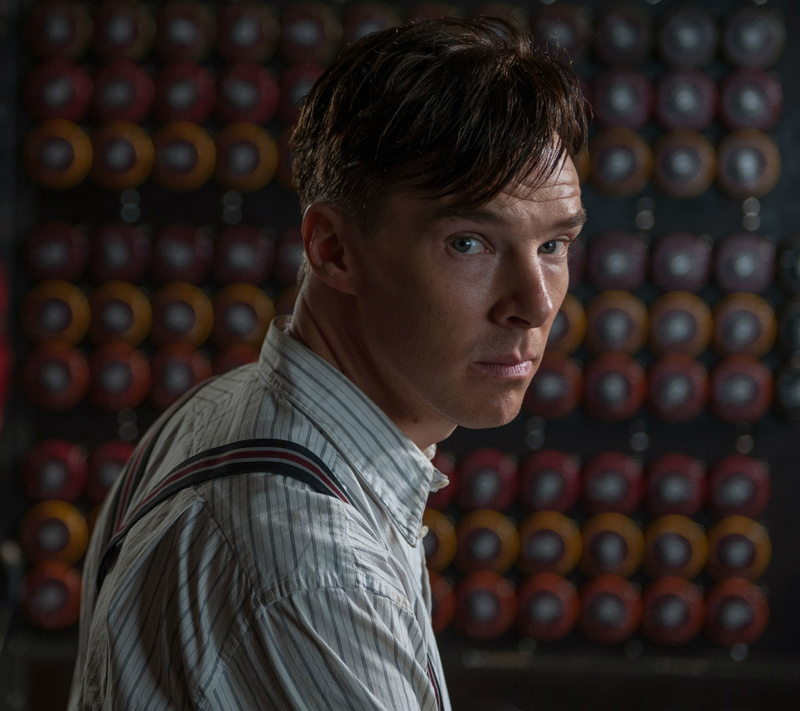 Benedict Cumberbatch plays British mathematician Alan Turing in The Imitation Game. "You're not asked to like the character," Cumberbatch says. "You're introduced to him, warts and all." The Imitation Game is the story of Alan Turing: British mathematician, World War II code breaker and seminal theoretician of computer science. "It's a war thriller, it's a love story and a tragic testament to a genius wronged," the star of the film, Benedict Cumberbatch, tells NPR's Robert Siegel. Turing, who was openly gay at a time when homosexuality was a crime in Britain, talked his way into a job helping the British crack the German code called Enigma. Cumberbatch says the film's script has a "beautifully complex unraveling through time ... the unraveling of both the problem and the man, himself, trying to solve the problem." I think what's extraordinary about Graham Moore's first feature script is how you, layer by layer, sort of uncover this man at the same parallel time as the team he eventually does play a part of. ... And I think, to be fair to Alan, what's beautiful about Graham's script in his introduction to him ... it's utterly uncompromising. There's no vanity, you're not asked to like the character. You're introduced to him, warts and all. And he is ... difficult; he's very stubborn and arrogant. But there's a sort of naive guilelessness about the whole thing. He doesn't come in with an abrasive attitude. He just doesn't have the formal respect for authority. ... And he is utterly brilliant and he knows it and he's been told that and he doesn't mind talking about it. But it's not to show off; for him, it's a statement of fact. It's disgusting to think that within less than 100 years [that] this was going on hundreds — thousands in fact — of men were prosecuted and given the chance to choose simply between two years' imprisonment or two years' state-sanctioned chemical castration through weekly estrogen injections. Alan chose the latter in order to continue his work. But the man was a marathon runner as well as a sexually active homosexual man, and not only did the drug ravage his body and affect his physicality but it also started slowly to impinge on his faculty, on his mind, on his ability to do that work. So he was denied the one door he still had left open to him for love, for freedom, for expressing who he was. In comparison to his achievements and his greatness — both as a scientific mind [and] philosopher ... somebody who ... basically was the father of computer science, somebody who was part of an effort that saved, some estimate, 14 million lives by breaking a code that brought about a two-years-early end to World War II. That that man wasn't better-known — I mean, why isn't he on bank notes with Darwin and Newton? Why isn't he on the cover of history books as well as science books? That really was a driving motivation for me to tell this story and bring his legacy to a wider audience. It's more than a machine. I mean, that machine takes on such a personality. .... A replica is still at Bletchley Park, which I advise any of your listeners who are lucky enough to be in that part of the world to go and see it. It's the most extraordinary, chilling, amazing exhibit of all the work. ... You can ask someone to give you a very patient explanation of it because it's quite complex. But basically, it was the machine that Alan adapted from a Polish machine to break the other machine, the Enigma machine — which was capable of ... 159 million, million, million possible variations every single day that would change at midnight. It was beyond the human ability to crack. "Where's the screen?" as one friend's child said. ... Broke my heart when I heard that. But the same kid then went home and Googled — using probably an algorithm very similar in the search engines that were used by Turing, invented by Turing to break the code in the second world war — used a Google search engine in order to look up and research more about Enigma. This is an 8-year-old. I mean, it's fantastic. Even I can't say it early on a Monday morning. It sounds like a fart in a bath. There's a whole lot of bubbles. She rightfully said, "Look, it's pretty unforgettable once you get your head around it." And I said, "Yeah, but even I can't say it early on a Monday morning." It sounds like a fart in a bath. There's a whole lot of bubbles. But, you know, it seems to have worked out all right, doesn't it, Robert? It's fun. It's got to be fun. There are moments when, like all of us, you get a bit self-conscious and you'd rather not be living any of your day in public. Those are the awkward times, but you've got to have fun with it.